There is a distinct advantage being a huge company with large reserves, you can slash the rates as per your convenience. It is even more advantageous when your primary source of revenue is not affected in the process. Owing to this, Google brings a lot of stuff in the market for free and for whatever else is charged for, Google adds its own spice of competition in it by keeping the prices low. In an event in San Francisco, Google announced that it is reducing the price of its cloud computing platform and bringing in more competition to Amazon’s AWS (Amazon Web Services). The price reduction was about 30% for computing across the regions. Also, around 65% reduction in storage and as much as 85% reduction in BigQuery has been made. This is a whopping price cut and will create many prospective clients for Google. Besides this, Google also mentioned that there will be future reductions as well in the arena of similar order. According to them, the prices of cloud should reflect the underlying hardware which has been observing price cuts over time. Google has also introduced sustained-use pricing. What this means is that people who use the services more intensively over longer period will observe even better discount prices. The whole process will be automatic from Google’s end and will not need the user to commit to sustained usage. This is very different from what Amazon offers and therefore gives Google a definite edge over its competition. But, in less than 24 hours of Google announcing their price cuts, Amazon immediately responded with their own price-cuts to match that of Google. Before Amazon’s new prices were announced, Google’s prices were between 38 to 60 percent cheaper on various computing instance usage. RightScale did the comparison (before AWS price cuts) and found that unless the commitment of user was for three years or more, Google holds distinct advantage with sustained use against Amazon’s Heavy Reserved Instance. Amazon’s new reduced prices that will be effective from April 1st, essentially brings back similar scenario as it was earlier before the price cuts. 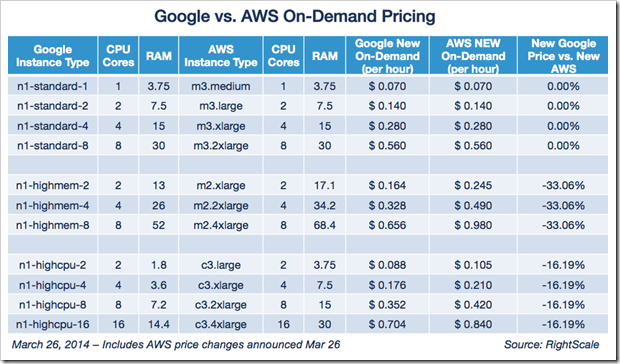 According to Rightscale, AWS matched exactly the new Google prices on standard compute resources. AWS also lowered prices on high memory and high CPU options. In the high memory instances, Google has a 33-percent lower price, but AWS provides 30-percent more memory, which is the focus on these types of instances, so these net out to roughly equivalent. Here is the comparison as it stands now. Now with this Amazon rate cuts, Amazon becomes much cheaper if the user offers ne-year or three-year commitment. There is a catch here though. With Google, any further reduction in price will also be incorporated in the three years. As Google is certain that prices will fall with time, over three years, it is highly likely that the prices for Google Cloud services will be lower than Amazon’s Web services. In all, one can safely say that price war has already started, and it will be interesting to see how Microsoft responds to these price cuts from Google and Amazon. Microsoft had previously announced that they would match AWS pricing, so one can be sure that they will bring down their prices. Given the changes over the last few days, it’s probably a safe bet that these three major cloud providers will continue to maintain competitive pricing.